By the time a person reaches age 70, she’s taking an average of 12 medications. The inability to take them unsupervised accounts for up to 40 percent of nursing home admissions. According to Medco Health Solutions, some seniors even take as many as 20 or more pills per day. That’s a lot of medication that can get misplaced, forgotten, or mixed up even for a spry young mind. The good news is that tech has stepped in with a solution in the form of automatic pill reminders. 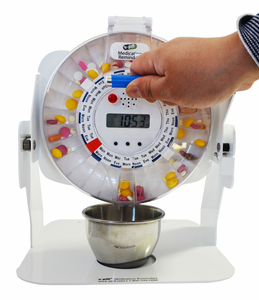 A company named E-pill (e-pill medication Reminders, www.epill.com , 1-800-549-0095) offers several medication-monitoring gadgets such as the E-pill STATION which stores a full month of medication and sounds an alarm when it’s time to take them. There’s also the E-pill Multiple Alarm Plus, which can be programmed with over 40 different alarms and even reminds you if you’ve missed a dosage. For as little as $30 you can buy the Multi-alarm TimeCap, which fits onto a standard pill bottle and tells you the last time the meds were taken, complete with an alarm to keep track of forgotten doses.